Now it is time to describe the project idea that I mentioned earlier in greater detail. I’ll start by giving a brief overview of aerosols and sun photometry. As I stated in a previous post, atmospheric aerosols are tiny (.01µm – 10µm), climatically important particles that are suspended in the air. They consist of many things — soot from combustion reactions, sand and soil particles drawn upward by wind, salt from sea-spray, sulfates from industrial and volcanic activity, among others. Regardless of their source, aerosols affect our climate in two ways: directly, by reflecting (or otherwise redirecting) sunlight, or by absorbing some of the sunlight that enters our atmosphere; and indirectly by affecting the formation and subsequent life-cycles of clouds, which in turn affects the amount of sunlight reaching the earth’s surface. Whether you know it or not, you sense the effects of aerosols each day. Let’s say you wake up early one morning to admire a sunrise. As the sun emerges over the horizon, the light emanating from it strikes the top of the earth’s atmosphere at a glancing angle, and it then travels a relatively long distance through the air before it reaches you. Air molecules and aerosols absorb and scatter some of that light, preventing a fraction of it from reaching your eye. As the sun rises higher in the sky, the sunlight strikes the atmosphere progressively more directly and the path length the sunlight travels through the atmosphere before reaching you is gradually diminished. The attenuating effects of the air molecules and aerosol particles decrease as the path length decreases. As a result, your eyes sense that direct sunlight becomes more intense as the sun rises higher in the sky. The opposite occurs as sunset approaches. Sun photometry is a ground-based method that atmospheric scientists use to study the optical effects of atmospheric aerosols. You can find a technical history and review of the technique in Shaw (1983). In a nutshell, sun photometry involves measuring the intensity of the direct sunlight from the sun’s disk, and then using those measurements to estimate the extent to which sunlight is attenuated by the presence of air molecules and aerosols. Figure 1 shows what a modern sun photometer looks like. The barrel of the instrument is aimed directly at the sun, and the instrument then records the intensity of sunlight in the visible spectrum and in portions of the invisible spectrum. Generally speaking, smaller particles are more effective at attenuating shorter wavelengths of light. So measuring differences in the attenuation of different wavelengths of light allows scientists to conclude something about the sizes of aerosol particles present in the atmosphere. A collimator tube, which reduces the instrument’s field of view. An interference filter, which permits light of a predetermined wavelength to pass while blocking all other wavelengths. A silicon photodiode detector and amplifier assembly for detecting incident photons and sending an output voltage that is proportional to the number of photons hitting the detector. A voltmeter for measuring the output voltage sent by the detector. Because interference filters deteriorate with age, Mims (1992) developed a filterless sun photometer that uses spectrally selective light-emitting diodes (LEDs) instead of silicon photodiodes. 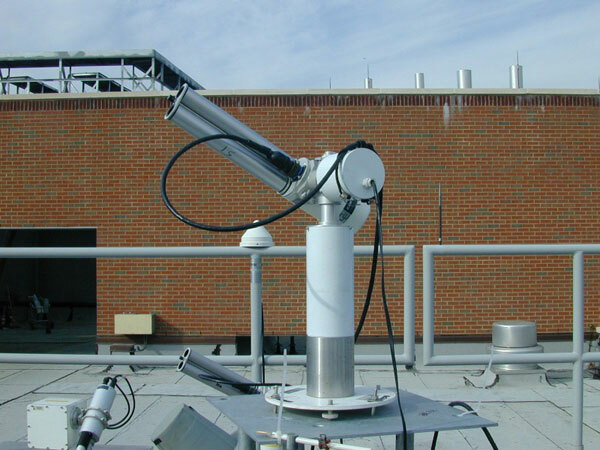 This approach has been very successful, and it has been used by Mims and his coworkers to measure aerosol optical depth, atmospheric ozone, atmospheric water vapor, and other important phenomena. The LED method has also been adopted by other research groups for various other purposes. I don’t plan to use LEDs in the sun photometer that I am going to build. I’ll save that for a later project. Instead, I will try to use a homemade spectroscope and second-hand digital camera to measure the attenuation of various wavelengths of light by the atmosphere. Why? Well, I’ve wanted to build a spectroscope ever since I was in elementary school but I’ve never gotten around to it. I’ve also seen some pretty cool hacks using cheap digital cameras and I’d like to give it a shot myself. However, I do hope to use LEDs in future light-sensing projects. 1. Mims, F.M., 1992: Sun photometer with light-emitting diodes as spectrally selective detectors. Appl. Opt., 31, 6965-6967, doi: 10.1364/AO.31.006965 . 2. Shaw, G.E., 1983: Sun Photometry. Bull. Amer. Meteor. Soc., 64, 4–10, doi:10.1175/1520-0477(1983)064%3C0004:SP%3E2.0.CO;2 . 3. Volz, F.E., 1974: Economical Multispectral Sun Photometer for Measurements of Aerosol Extinction from 0.44 μm to 1.6 μm and Precipitable Water. Appl. Opt., 13, 1732-1733, doi: 10.1364/AO.13.001732 . 1. NASA has a very cool site here that describes the basic features of atmospheric aerosols, including their effects on climate. 2. Satellite-derived pictures and movies of the global distributions of aerosol size and aerosol optical depth can be found here. 3. Here is the obligatory Wikipedia entry on aerosols. It is a little thin, but it does have a few good links. 4. Here is a short blurb by Dorothy Koch of the NASA Goddard Institute for Space Studies on the potential cooling and warming effects of aerosols on global climate. Arborist/landscaper by day ... amateur scientist by night! This entry was posted in Aerosols, Outside Science Project 1: Aerosols, Outside Science Projects. Bookmark the permalink.